Happy Saturday, folks. I wanted to drop by for a super visual, but relatively short update in terms of my thoughts. I will offer up another update in a few hours (after the UK game ;)) and that will get much more specific. Those lines may get bumped north a bit with the next update. I told you this update was going to be high on visuals and I’m a weatherdude of my word. Let’s take a look at the individual models to see how they are looking. The new version of the GFS isn’t finished, yet, but appears to be in line with everything else outside the GFS, which it’s set to replace soon. The euro will be off and running shortly. I will have both those models and a new call for ice and snowfall with the next update. Have a good one and take care. Hoping it continues to inch more northwest so my county can get in on some big snow totals… hopefully! Thanks CB!!! The new GFS done great with a lot of the heavier rain events earlier this year. Why want NWS consider the new version yet? New GFS has our SE counties in the green..Hope it gets this one right..Been steady as a rock..Might be the new KING..
I’m new here. What does in the green mean? Green for rain or deep snow? Anyone have a link to the new euro Chris said is way north in his tweet? Anyone have any clue if it could start snowing sooner in Southern KY with models going north? Those locations to the north, watch the dewpoints. Drier air will attempt to erode precipitation chances. Models might not “see” this very well. 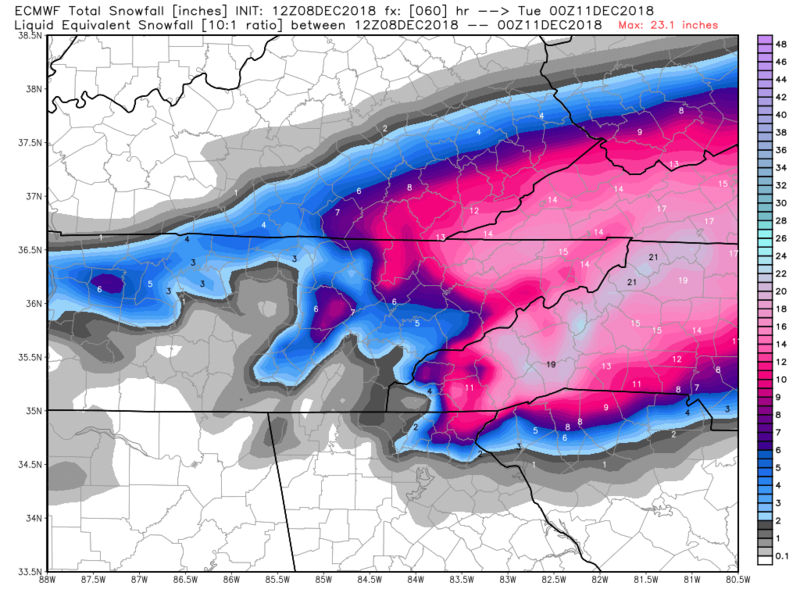 Welp..Believe it may be time to go get some gas for the Generator..Euro pretty much like the FV3 but upped the totals some..Expanded coverage to..Just wonder how much of that is zr..
A longs way to go yet but Harlan might be ground zero for the most overall. Other than the blip yesterday, Harlan had consistent runs from multiple models from over 5 days out of double digit totals….can’t ever remember seeing that before! …and those double-digit snow totals for southeast KY, if storm system is getting stronger, warmer air could nose in producing other p-types, drastically cutting into those totals. I’ve been burned on this before…. Plus, the ratio factor…an inch of rain is generally under 10 inches of wet snow when it is this warm….we will see. If the ground is fully covered only, I will be happy and just enjoy what I think is the beginning of an epic winter season!!! I agree. Nothing more serene than an untouched, sparkling white blanket of snow on the ground. I need almost 3″ for that to happen. I figure about 7-1 ratios..Just a guess..850 temps’s and dew points i guess is figured in the equation..Just hope it’s all snow with no ice..Getting just half of what models is showing would be a win..
Charleston NWS has partly cloudy for the tri-state from today thru Thursday then rain and mid 50’s for next Friday. Looks like a another Winter of disappointing backside flurrie events. The northward surge is starting out in far west KY/Missouri! Further north than originally thought? Just wow..Getting Nam’ed..Been a long time coming for SE KY if true..
That has cut my snow in half from the 06z run. Morristown has expanded both winter storm warnings and advisorys deep into the valley! Poor ole SE KY has not been warned by anyone other than Chris! Chris, you truly have been incredibly accurate over the years and your dedication is appreciated more than you know! According to the WV channels, Pike County is now under a Winter Storm Warning…I’m sure that includes all of SE KY but just showed Pike County since we are in their viewing area. Anything for Huntington Ashland areas?